Yes, you read that right. I WAS TOO TIRED TO BAKE MY DAUGHTER HER FIRST BIRTHDAY CAKE. Guilty, guilty. In the morning's mad rush to the grocery, the bakery cakes looked waxy and expensive. I opted for a $2 Pepperidge Farm cake, but I didn't realize it would be so flat. Guests were on the way. 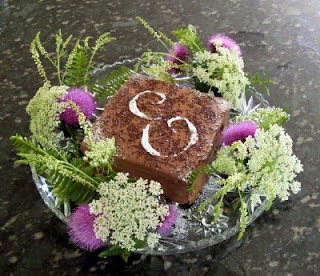 I had less than an hour to prepare lunch, set the table, and personalize this brown square. I prayed for inspiration! Place your Pepperidge Farm cake on a large platter. Decorate it on the diagonal. I don't know why, but it looks better that way. My original plan was to copy her great-grandmother's embroidered "E"--in pale blue icing on a white-frosted cake. No time for that! 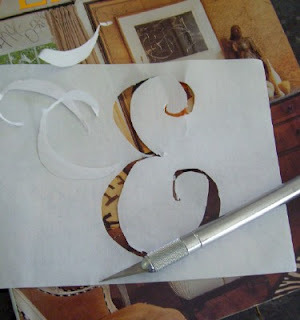 I used a craft knife to freehand a stencil on scrap paper. 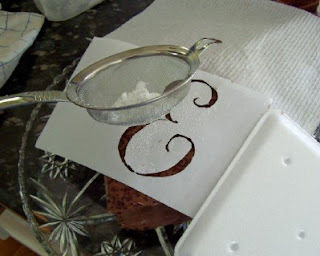 I dusted the stencil with confectioner's sugar through a fine mesh strainer. Cover areas you don't wish to whiten. 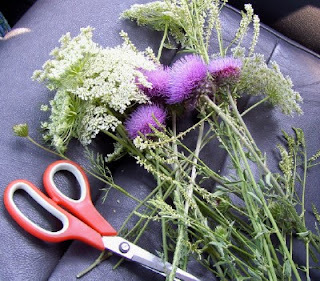 In two minutes, I had a handful of Queen Anne's Lace, thistle, and a feathery white wildflower. Thistle does not prick if you hold the smooth section just under its head. The clock was ticking. I wiped my brow with a kitchen towel and fashioned four wildflower posies for the platter. Elise's Pepperidge Farm birthday cake almost looked pretty enough to fool our guests. All that mattered: the Pepperidge Farm cake had enough chocolate icing for the requisite first cake-smearing photo! In a similar emergency, you can use fresh strawberries or grapes for decorating a Pepperidge Farm cake, or dust it with chopped nuts and caramel drizzles. Now it's your turn to 'fess up. Have you ever disguised or decorated a storebought cake for guests? Any tips? How resourceful! I think the cake looks very pretty! 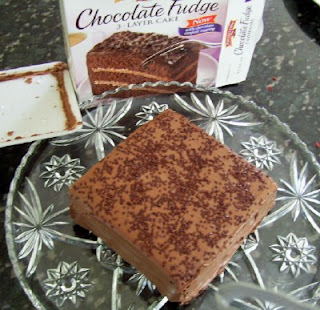 I **love** Pepperidge Farm cakes (but only get them once in a blue moon because they are not healthy LOL)!!! Absolutely beautiful! Happy birthday, Elise! I think the cake was wonderful. It is the thought behind the cake that will mean something to her in the years to come. That thought is the E that you put on that cake. It was inspired just like your blog. 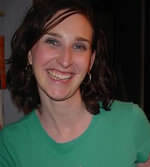 I love your blog and I think your daughter is lucky to have such a family behind her. Best wishes to you and to her on her birthday. My 11-yr-old looked at the pics and said, "Can you do that for my birthday?" Absolutely beautiful! I can't say that I have ever dressed up a bought cake like that - but it is wonderful indeed! I love reading your blog! How absolutely Beautiful!!! You are so creative with this sort of thing! I sure wish you lived close by here! I've been given the fun chore of planning my parent's 40th wedding anniversary party. My SIL and I have decided to do a 1940's Big Band/USO theme. They both love the music and actually met in 1968 at a USO event. If you have any ideas for this, I would love to hear them! You are just so creative with this sort of thing and since I'm working on a tight budget, I bet your ideas would be REALLY helpful! Happy Birthday to little Elise! I've never dressed up a store-bought cake (maybe I have-but so long ago that the memory fell through a hole in my swiss-cheese brain), but you make it look so lovely. Thank you for sharing your beautiful life with us! It's truly inspirational. 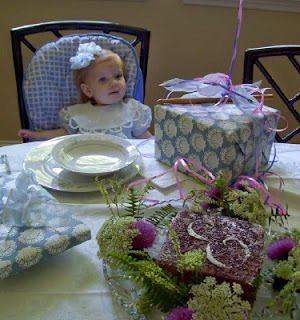 Meredith - The cake looks lovely and Elise is so adorable! I don't think I've ever dressed up a cake to serve as a cake, but I do make a very last minute strawbeey shortcake with a bought angel food cake when I'm out of time to make a dessert. Just tear up the pound cake and layer it with frozen strawberries and their juice and whipped cream. If you put it in a cut glass punch bowl it looks very pretty and not at all "bought." Shannon, that sounds EASY! I have the perfect glass bowl for it, too. Lovely cake with the poseys! Yes, I have dressed up bought cakes many times--I bought those little tubes of decorating frosting and went to work making swirls and scrolls and writing the birthday child's name on the cake. Stick the candles into any of the blobs that look particularly off-kilter--after you light the candles, nobody will notice any imperfections. You are so creative. It looks great!! 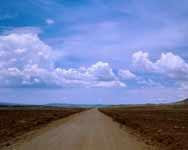 I have enjoyed your blog for some time now and you must know how are inspiring you are. Thanks for all the great tips. Honestly, I simply cannot believe that Elise is one year old!!! Happy Birthday, sweet girl! She looks like a beautiful little angel in the picture. And I thought you did a great job with the cake. Boy, have I had experiences like that!! Seems like I am always rushing around to get everything ready for a party like that, and when it's over, I feel like collapsing! I see you've already got your "new" garage sale chairs all painted and rotated into service. They look great, from what I can see in the picture! Oh that is a fabulous idea! ANd you're not as bad as I am, tomorrow is my daughter's birthday and we've got the house torn up from a remodel and a million things to do tomorrow that were supposed to be out of the way before now. It briefly flitted through my mind that if I told her her birthday was Friday she'd never know the difference and I'd have an extra day before having to do all the birthday stuff. But then I snapped to and felt sheepish for thinking such a nasty Bad Mom thought. You did great! :) Everything looks fantastic for a princess! My second child received a single store-bought muffin with a candle in it--at breakfast! We were on vacation. I felt guilty that I couldn't get my act together well enough to provide a cake with the all important frosting, but that didn't last long. She still got the song, was surrounded by family (inluding aunt, uncle and cousins), a few gifts, and the "birthday cake" all to herself. You make it all look so easy. I think the cake looks gorgeous and you are such an inspiration to me. I admire your ability to take something ordinary and make it extraordinary with minimal cost! You truly are amazing! I always make the ugliest cakes, so for birthday parties my kids get deli cakes all the time. oh well...martha stewart I am not! The worst thing I ever did was buy fried chicken at a deli...and gasp...pass it off as my own! I took a meal to a new mom and she went on and on and on about how great the chicken was and kept raving about it. I was too embarassed to admit it came from the local deli. I never told her the truth. At least she never asked for the recipe, i'd have to fess up then! I'm fessing up to buying my daughter's first birthday cake, too. But we didn't even buy a cake--we got 6 white cupcakes from the store! I think that came out beautiful! Yes, I've used store-bought Entenmann's or Pepperidge Farm cakes. It's amazing how cute you can make a cake with some M&Ms or other candies! Most years, though, if I am gonna buy a cake, it's usually an ice cream cake! I'm sure they can be made at home...but I ain't gonna try one of those. Now, my mom...every single year, we got the most amazing angel food cakes on our birthdays! Hooray for mom! I think it is beautiful- I admire how resourceful you are! Happy Birthday, Elise! She looks precious and I love her fancy bow! So cute! May I ask a silly question? Thanks (smile) I am afraid of hidden bugs on flowers like that. Do you wash them? Do you take the time to check them before putting them into your car? It looks beautiful and the best part was that you did not go completely crazy trying to squeeze one more thing into a busy time. I know the feeling of "mom guilt" though. For our son's first Christmas, we were so busy with "design to sell" projects and having the house ready to show that we skipped a tree entirely. The next year we were all sick from Thanksgiving on, my husband particularly with bronchitis so we didn't follow our pre-baby tradition of going to a tree farm in the Sierra Mts, instead resorting to a fake tree bought on Christmas Eve. Finally this last year we did it "right," putting the fake tree (have to keep using it for the price, even at 50% a pre-lighted 9' tree is pricey) up at Thanksgiving. Amazing! Just Amazing! and I can't believe she is a year old already. I suppose you can't either. And...you keep your camera in the car to take pics of the flowers you rescue?! I don't think I've ever disguised a cake but I do keep a small pair of scissors in my purse! I keep scissors in my glove compartment, and I keep my camera in a case in a pocket of my diaper bag pretty much at all times now! You never know when the kids will do something cute, or you'll find something worth snapping for the blog! I was cutting those flowers by the side of the road and thought to myself, "This morning looks like something to blog about!" Paula, I do a very hard shake on the flowers before I put them in the car. Then, I usually work on my back stoop while cutting. That gives any bugs another chance to crawl away. Finally, I look flowers over very carefully before placing near food. Garden flowers have the same bug potential, so I didn't think it would be too horrible if the worst happened! The cake looks beautful , the wild flowers really make it look special. I have been reading your blog for awhile , I believe I found you during the One World ~ One Heart Giveaway. You are such an inspiration with your frugal ideas , love reading your blog each week. What a beautiful, beautiful cake! and what a great idea. We always have Pepperidge Farm cakes for summer birthdays, since we're away at a little family vacation cottage with a small kitchen that gets way, way too hot for baking. I think I've eaten every variety of PF cake there is, since often we're a crowd, and need at least two! This is beautiful, just beautiful. You have a gift, Meredith, you really do. But I admit I am just a tad concerned about the 'feathery white' wildflower. I can't tell from the picture. Could be yarrow, and probably is. But there are some toxic plants out there that are also quite pretty. Even though I didn't know the technical name of this flower well enough to identify it for all the world to see on the blog, I have picked it all my life--as I have the other flowers pictured. the flowers are from a meadow situated far back from the roadside that receives no chemical treatment, just an annual bush hogging once a year.